Sunday morning, I was still tired from Saturday... especially thanks to Daylight Saving Time... and still worried about Eric's missing sketchbook. I starting listing off things we needed to do, and when I got to "find the sketchbook", Eric stopped me. "You found it last night," he said. "Huh?" "You found it last night. You got up and put it on my bedside table." "HUH?!?" After a few moments of confusion, we figured out that I had somehow, in my sleep, found the sketchbook and even told Eric where I'd found it. I have been known to sleepwalk and talk, and apparently that's what I did Saturday night because I was so worried about Eric going to the con without his sketchbook. I gathered up the stuff we needed, including the old cell phones. I forgot to put the blank sketchbook in my bag. Eric carried the troll and his witch feet, along with his mysteriously found sketchbook and a bag of jelly babies for Kirk Jarvinen. I had my sketchbook and the camera, along with my notepads for scribbling down people's names. 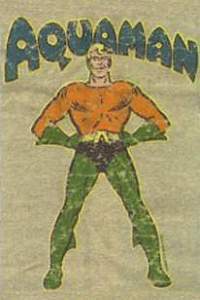 I was wearing my "worn" Aquaman t-shirt. We took off early in the hopes of getting free parking near the Event Center, although I warned Eric that, because of the construction nearby, free parking might be hard to find. As it turns out, we might have been able to find a spot. But we ended up parking in the North lot ($9 again, ouch), which was about as far from the entrance to the Comicon as any of the spots in the parking garage, only with no stairs (or elevator) to worry about. With my feet still feeling Saturday's pain, it was a good bit of a walk anyway. We got to the entrance before the doors opened, and there was a small line. We got in line and began to relax and chat. A Qwest Field Security guy came by and pre-searched our bags. A young man and his mother (or grandmother, I didn't ask) got in line behind us and we started talking. He told me it was his first ever convention. He had been in baseball practice the day before, so he hadn't managed to come. I asked who he was most looking forward to seeing. He said Erik Larsen. I managed a chuckle and a grin. I pointed to the entrance, and pointed out the Image booth. I told him that yesterday Erik was front-and-center, and he'd probably be in the same spot today. I told him to ask politely for a sketch. He was aghast. He had never even considered getting a sketch and hadn't brought a sketchbook. I reached into my bag... but I hadn't brought the extra one. Curses. I told him it would be ok, Larsen would find something to sketch on. We talked a bit more, and I gave advice and showed off my Aquaman sketchbook. Suddenly, Eric realized he'd forgotten the checkbook. He decided to go back to the car, although the con would be open by the time he got back. We agreed to meet at the Illusive Arts booth. Sure enough, the line started moving just as Eric vanished out of sight. The kid and his mom followed me in and I went right up to Jay Faerber, who had been next to Erik Larsen on Saturday, and with the kid behind me asked if Erik would be back again. Yep, same place, said Jay, in fact he'd be back any minute. I told Jay that the kid wanted to meet Erik, and Jay pointed to Larsen's spot and said to just wait here. I smiled, said "good luck" and set off to find P'la Jarvinen. I had a bag with three cell phones in it, and I didn't really want to carry it around throughout the con. I was hoping to dump it off on somebody at the Mercury Studios booth, but when I got there, there was nobody there at all. Stymied, I went over to the Illusive booth, where they were still getting ready. Eric didn't show right away, so I kind of hovered between the Mercury booth and the Illusive booth, until I spotted Eric at the Illusive booth and went back. I didn't feel like carrying the phones around, so I asked Anna if I could leave them there for a bit. She was cool with it. Eric took a little time to take pictures of his witch feet with various Illusive Arts items. He also tried to buy the trade from them... I say "tried" because they insisted on giving it to him. They also gave him a decent discount on the necklace, which I now own. I plan on wearing it to the Winkie convention, and at the next Oogaboo Rendezvous (this Saturday, we're hosting). After our main business was concluded at the Illusive booth, Eric and I set off to Troll Gigi. Gigi Edgley, due to flight problems, hadn't made it to the con at all on Saturday. But first thing Sunday morning there was already a line. 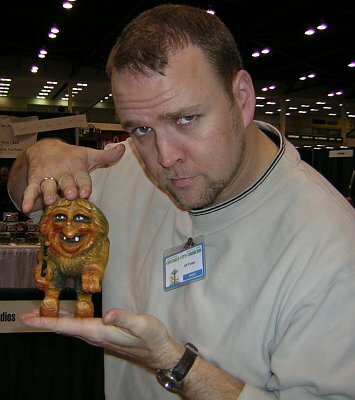 We quickly confirmed with the Farscape handler that the troll pic would be ok, then got in line. The guy in front of me had a lot of people to get autographs for, so I turned to the woman behind me in line and said, "You see that guy over there in the Girl Genius booth? The one with the goggles around his neck?" "Um, yes." "Do me a favor, will you? Go up to him and say 'Once a week! It's all we ask!'" "Why?" "I'm trying to get him to update his webcomic." "Oh! Ok!" So she merrily wandered over to poor Cheyenne Wright and tormented him just a little for me. I saw her talk to him, then he started, looked at her in consternation, then looked around wildly. I waved. He spotted me, rolled his eyes, and waved back. The woman came back in line and said, "That was fun!" "Yup!" I said, "Thanks!" Gigi was amused by the troll, and happy to have her picture taken with him. She posed differently than anyone else so far has posed, and I do believe that this is the happiest the troll has ever been. Next to Gigi, at the Farscape/Buffy fan booth, we spotted an Angel puppet, and Torvald just had to pose with him. I do believe that Eric also got a picture of his witch feet underneath the puppet, too. After trolling Gigi, we went back to the Illusive booth and got the cell phones, which we gave to Kirk Jarvinen who was now at the Mercury Studios booth. We also presented him with his jelly babies, which he tried out immediately and shared with Karl Kesel. We hit the freebie table at some point during that first hour, and at 11 am we headed up to the balcony for the DC Panel. This time we were nice and early and we found seats behind Heidi Meeley and, as I didn't figure out until I was back down on the floor almost two hours later, Polite Scott and his wife. Gail Simone popped up and sat down in the audience, even though she was supposed to be one third of the panel. We chatted a bit, and somebody (Update: Gail's husband, see the comments) asked me if I wanted an Aquaman heroclix they'd got in one of the promo boxes and gave it to me when I said "yes". 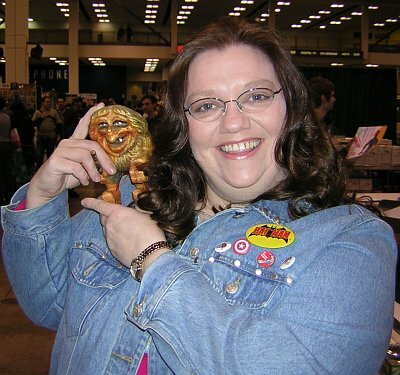 Then Kurt Busiek arrived, along with a convention lackey, and with the help of four strong guys from the audience the table was set up on the stage and Gail and Kurt had a seat. Bob Schreck was the last third, and it took him awhile to get up to the balcony because the elevator was not available. Before Bob arrived, Kurt opened up the floor to questions, so I immediately popped up with "Is the new Aquaman the old Aquaman's son?!???" Kurt glared at me for a brief moment, then answered as if I were serious, "NO! He's exactly who he says he is." I turned to Eric and said, "I just thought I'd get that one out of the way right off the bat." The questions ranged all over the place, which was unfortunate, because Gail and Kurt each only have knowledge of their own books, and once Bob arrived, his knowledge of books was limited to the lines he edits. While I can't say there was absolutely no new information, what information we got was pretty limited. With about fifteen minutes to go in the panel I began to feel the water I'd been drinking, and it along with that odd shaking movement of the balcony made it necessary for us to leave early. That's probably when all the fun info was shared, I just know it. After a short rest, Eric and I resumed wandering. There were two more Torvald pictures I wanted to get for sure. Both Karl Kesel and Jeff Parker had been missing from the Mercury Studios booth the day before, and I wanted their pictures on Torvald's page. So we headed back, yet again, to their booth and caught them both. Both were willing to be trollographed, and both pictures turned out great. I'm going go show you Jeff Parker's, because I think he's as dynamic in person as his excellent book. Eric left his sketchbook with Kirk, who was working on another piece, and we wandered some more with the troll out and ready. If it sounds like we do a lot of wandering at these cons, that's exactly right. I don't tend to go in straight lines at cons, and I swear I walked more over the weekend than I did during the entire 3-day. I next ran into Greg Scott Bailey, who tells me that things are finally coming together, and the site should be updated with solid information soon. We also stopped by the Comics Fairplay booth again to get another picture of Heidi Meeley. The first picture really didn't turn out. I wouldn't have wanted anyone to post that picture if it was of me... the glare from her glasses made for a very odd look. So I got another two pictures, both of which looked ok. I also learned that I'd been sitting behind Polite Scott and hadn't even realized it. ARGH! Heidi said that she'd left the panel a bit early also, and promised to let me know if she ran into Scott again. I also snapped a troll pic of P'la Jarvinen, since she was at the booth chatting with Heidi. A few moments later, the young man I'd been talking with in line passed by. I said hello and asked if he'd gotten a sketch, and he enthusiastically said he had. I gave him a high-five. It was clear he was having a great time. His reaction pushed me over the edge to do something I've considered for a couple of years. Eric and I wandered over to the Image booth, and I got in line for Erik Larsen. Eric raced off to get his sketchbook from Kirk, if he could spare it. He got back in plenty of time, and was able to ask Larsen for his usual. Any character from Oz, or any character at all as a Green Lantern. Erik chose to sketch a Tin Man for Eric, but had some trouble remembering the look. He mentioned that he really wanted to draw Tik-Tok, which would have been cool, but he just couldn't do that on-the-fly. Maybe at some other con, we can bring a reference for him. While Larsen sketched, the troll monitored his progress closely. Larsen has the strangest drawing style I've ever seen. When someone asked him when he'd developed the style, he said it happened the first time he picked up a pen as a child, and he drew well enough that nobody ever corrected him. After Erik finished drawing, Eric took his sketchbook back to Kirk. And I took a picture of Larsen with Torvald the troll. Then came the moment of truth. I asked Erik Larsen if he'd be willing to draw an Aquaman sketch for me. He thought about it for a bit, but agreed. It was fun to watch him draw in his unique style. He drew an Aquaman looking to his left... and then said, "What should I put over here where he's looking?" I suggested a fish, but that didn't suit him. So he drew something else in that spot. You'll see it when I post it. Around this time I did a little booth sitting in the Comics Fairplay booth to let Eric wander. Heidi's husband was selling some original art, and when Eric came back the two of them somehow conspired to get me a piece that featured Vulko and Koryak prominently. I would have also liked the other Aquaman piece he had, but I didn't feel right even asking for one, so I didn't. Eric got the one for me anyway. Did I mention that I love my husband? There might have been a chance he would have sprung for the second one if he'd had more dough on him, but by that point in the con the Cash Machine outside the Event Center ran out of money. Bad planning, that. We left the piece of art at the Illusive booth, who are complete lifesavers, so we didn't have to carry it around. Next up, Eric and I took our troll, sketchbooks, and our copy of Banana Sunday over to Paul Tobin (Root Nibot) and Colleen Coover. I trollographed them (though the picture is a little bit bad, as Colleen blinked at the wrong moment), then Colleen agreed to do a sketch of Aquaman. I think you'll all enjoy it. I certainly do. Overhearing me talk with Collen and Paul was Corey Lewis, creator of Sharknife and Peng. He was interested, so I asked him if he'd like to try Aquaman as well. He did, and I got a great sketch which I'll post later. For whatever reason, I forgot to get a picture of him with the troll. As an aside for the moment... my feet are beginning to ache as I look at where we went next. Did I tell you that Monday morning I found a blister the size of a half-dollar on the pad of my left foot? And another small one on one of the toes on my right foot. They've shrunk rapidly with me resting off my feet for a day, but it was still pretty nasty to walk around on Monday. I think I also forgot to mention the fire alarm that went off Saturday afternoon. It was the lamest sound for an alarm I've ever heard. A kind of low whoop that at first I was sure was caused by some promotion in some booth, except that all the fire alarm pulls were flashing. It took me longer than most to catch on, then I wondered if we should, like, head toward the exits or something. But nobody moved. The green shirted Lackeys weren't evacuating, nor were the Qwest Field employees, so it became something of a bust as far as fire alarms go. As one person pointed out, if there had been a real fire, somebody would have reacted OR we would've smelled smoke OR the lights would have flickered OR they would have made an announcement on the loudspeaker. Absent all of those, it seemed safe enough to stay put. Right, back to Sunday. Eric and I wandered back to Artist Alley to bug Kurt again (I got my fill of Kurt-bugging in for the year at this con) and I got to trollograph Pia Guerra and Dev Madan. As is usual whenever I get near them, I started chatting with Karin and Suzanne. Suzanne was describing a new use for leftover pizza called (I think) Eggs Markos, in which you cube the pizza and scramble it into eggs as a breakfast treat. This intrigued me, as Eric and I had had pizza for dinner Saturday night, and there were leftovers. I haven't tried it yet, but I intend to. At some point in here I did a little bit of booth sitting at the Illusive Arts booth, and thus Polite Scott and his wife were able to find me just before they took off to visit the Science Fiction Museum. Next up we headed back to Kirk Jarvinen's booth to see if he'd finished Eric's sketch yet. Across the aisle was the Penny Arcade booth... and yes, I trollographed Gabe and Tycho! 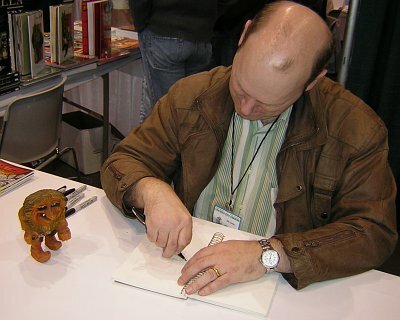 Gabe is the really cute one holding the pen and Tycho is the one holding the troll down. 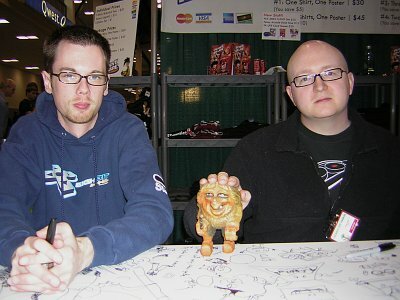 I didn't find it necessary to ask them for a sketch, as I've already got a sketch from Gabe from last year's ECCC. But I was wondering what they'd think of Eric's sketchbook. In the meantime, Kirk Jarvinen was going above and beyond all call of duty with his sketch for Eric. In fact, the word "sketch" does NOT do it justice. It was a fully colored "piece". It's going to be daunting for every other artist who takes a look. It's the Adam West Batman as Green Lantern, and I will be scanning and posting it. After he finished, he showed us a gift he'd gotten from the Meeley's for donating a piece to their ACTOR drawing, Boris the Bear as Doctor Who by James Dean Smith. At this point, both Eric and I realized how late it was and just how hungry we were, so we headed back to the car for our packed lunch, and to dump off any and all extra stuff we'd gathered, including my new page of Aquaman art.